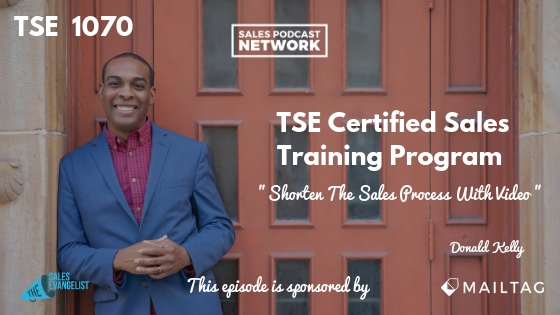 TSE 1070: TSE Certified Sales Training Program - "Shorten The Sales Process With Video "
Even if you’ve been selling for years, it’s possible that you’ve overlooked some ideas that will help you perform better, like working to shorten the sales process with video. 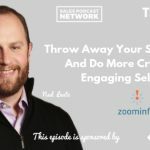 Today we’ll discuss some ideas that will help you shorten your sales cycle and some ways to use video to accomplish it. I’ll also share a real-life example from one of my clients to demonstrate how effective it can be. Video is so simple and so powerful that it’s hard to imagine that some people aren’t taking advantage of it. We’ve talked about it on The Sales Evangelist for months because it’s a powerful tool that’s available to every seller. I recently read a study that showed that 7 out of 10 B2B buyers watch a video somewhere in their buying process. So 70 percent of buyers are watching videos that are usually generated by the marketing department. But why aren’t we in sales using it as well? It’s simpler for the buyer to consume, and it isn’t difficult for us to make them. Videos are everywhere and we engage with them daily on Netflix, YouTube, and other places. Stories are part of our lives. We can use them in our prospecting, in our closings, and to build value throughout the entire sales process. Use video to follow up with a client or share a testimonial. Create a video overview of your product. Chaz works in the 3D printing industry, which for some of us is still rather unfamiliar. Because his product is cutting-edge, it can be difficult for him to explain what he’s doing to his customers. The emails can get long and confusing. His customers have lots of technical questions. Chaz realized that it would be very time-consuming to answer all of those questions each time they arise. When he tried to get his customers to hop on a call so he could answer the questions, they often went dark on him. He decided to use video to answer questions for his customers. It shortens the process because it’s quicker than email, and it helps him build trust with his customers. Chaz said that he can shorten the sales process with video by up to a week. If you could shave time off of each of your deals, how much more could you process? How many more clients could you obtain? Could you close more deals or earn more commission? Imagine your current customers running into trouble with the product you sold them. Instead of asking them to ship it back to you so you can troubleshoot the problem, why not use video to help them identify the glitch. You can walk them through the process and provide guidance that will help them improve the outcome the next time. Chaz uses the video to carry the customer through the process and it freed up more time in his day because he was able to help his customer quickly and efficiently so he could move on to other things. We’ve told you about a number of different video tools like BombBomb, Loom, Wistia, and Soapbox. There’s another called Vineyard, and probably many more that I haven’t named. Video humanizes you for your customer, and research has proven that people do business with those that they know, like, and trust. When your customer can see and hear you, you’ll be able to build trust much more quickly in addition to helping your customer. You can use video in your prospecting by following up with your prospects. Try using it in your outreach process to see what kind of results you get. We’re testing it ourselves and seeing amazing results. Chaz is part of our TSE Certified Sales Training Program beta group, which wraps up in a couple of weeks. 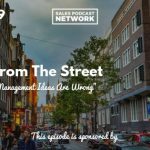 You can connect with him on LinkedIn, and you can watch the videos I mentioned earlier in the podcast here and here.